For most of my life I've watched my dad grow watermelons. I would have to say that it's been his passion. He's talked to people, read articles, experimented and had a lot of fun growing huge watermelons. And it hasn't been without some notoriety. He been in several newspapers over the years, and even been on TV. 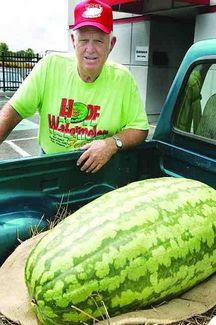 Recently he went on a pilgrimage of sorts to Hope, Arkansas to meet the man who grows some of the largest watermelons. He even bought a huge melon to bring back and get the seeds out of it. But I think most of all he bought it to show people. He seems to love seeing people's reactions when he shows them a huge watermelon. He put it in his car or truck and drive it around and show it to any one who'll look. He loves it! Sure enough he's caught the attention of several people and ended up in the news again. The most amazing thing to me - I can now Google my dad - Weird huh?